We chose our March Madness Bracket by the ultimate test of athletic ability, a cage match between each team’s mascot. 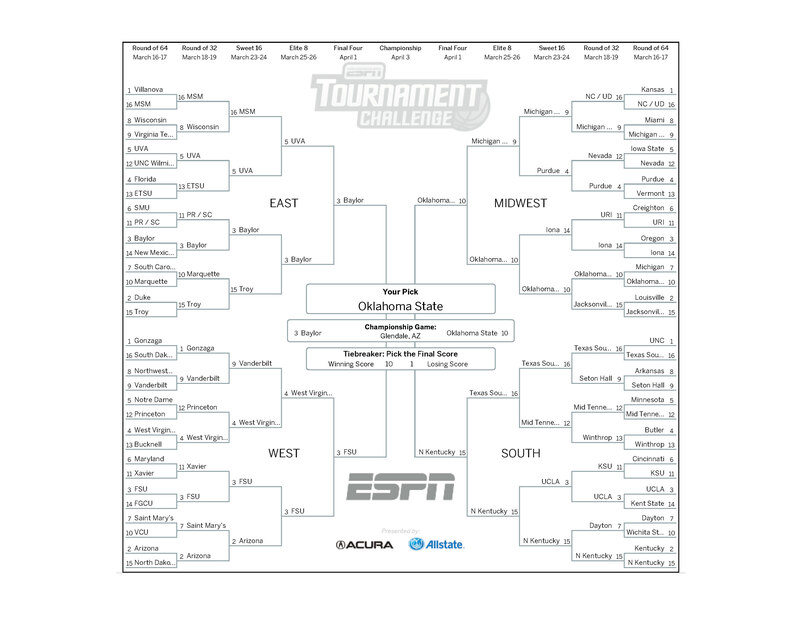 In our bracket the mascots are not guys in suits, but living, breathing, incarnations of their characters. There is one rule: They must fight. A Grizzly Bear Vs a Man With Two Guns. Some of the group believed that in a cage match circumstance a skilled hunter/fighter with two 6-shooter pistols would be unable to take down the average grizzly bear. They believed that bears are magic and can dodge 12 bullets. Like the bear version of Neo from the matrix. A few of us held to the belief that men with guns can and have been successfully killing bears for hundreds of years. It wouldn’t be an easy fight but the man is going to win in the end. One of our story Instagram posts captured one of these many controversial Man Vs Bear match ups. Follow Us On Instagram for More Story Posts! In this first match-up, the majority voted for Bear. And as this match-up continued to show up, Bear Vs Trojan, Bear Vs Mountain Man, Bear Vs Cavalier, Bear Vs Buccaneer, “Neo The Magic Bear” continued to triumph. A break in the stubborn “Neo The Magic Bear” majority finally occurred after we found an interesting new piece of evidence. While determining if a Mountain Man could kill a Bison we came across a headline that would change everything. Proof that not only could a man with a gun kill a bear, but an actual March Madness team mascot HAS KILLED A BEAR. After this revelation things got a bit hairy (get it?) for the “Neo The Magic Bear” enthusiasts. As we approached the end of our bracket the 6th round Match Up appeared again, but this time as the championship game. Baylor’s “Neo The Magic Bullet Dodging Grizzly Bear” pushed through into the finals and was matched against Oklahoma State’s mascot, PISTOL PETE. Yes, the spitting image of the first fight of Man Vs Bear was going against each other again. In fact, the Oklahoma State Mascot is so similar to New Mexico State Mascot that they have actually sued New Mexico State about it. But this time everything was different. First of all, it had been two hours since we had started picking our teams. We had descended into ourselves, we became the mascots that we picked: Gnashing teeth and brandishing firearms. We were bears, wild cats, and mountain men. It wasn’t about team building, and it was never about basketball. As the afternoon dust settled we took a vote. 4 to 3. 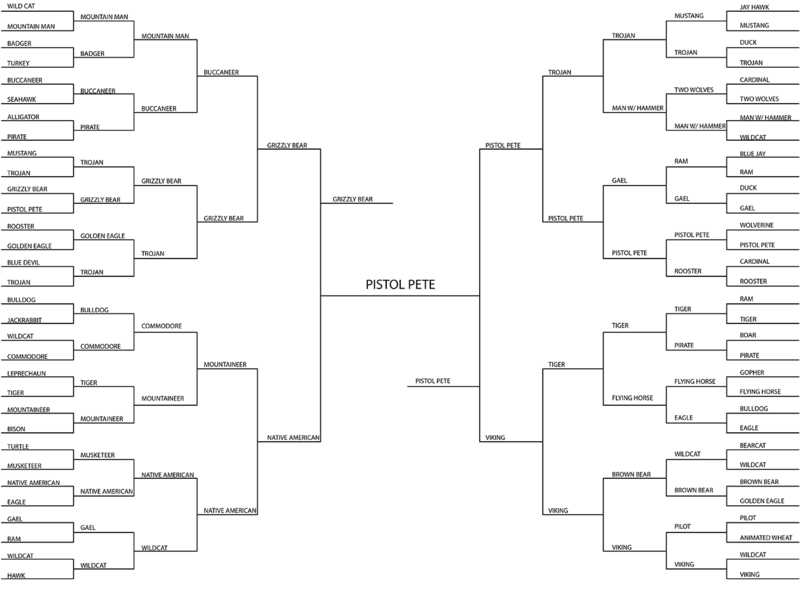 Pistol Pete had it. The last and greatest accomplishment of Oklahoma State. In vengeance of their brother in honor, New Mexico State. I may have exaggerated the amount of brutality that went into our March Madness picks. Some of them were more fun than ferocious. For example, The Wichita State Mascot is hilarious. The “Shocker” for all his gluten glory is nothing more than a bunch of wheat. He was matched up against the University of Dayton, which is a man wearing 1930s era pilot gear. However, unless the Flyer has a gluten allergy it’s not much of a fight. I’ve been informed by the more sports-knowledgeable members of the Overneath crew that this type of upset has never happened and is likely impossible. If the 1 seed teams ever want to advance in our bracket I suggest they give their mascot a man with two guns, and a bear, just for good measure.